I'm having my own Spring Fling @ My Cozy Corner. It's been busy here in the garden lately. I was in the garden most of last week. I try to work only about four hours a day. Pulling yellow dandelion and planting annuals for our garden tour. The daffodils are just beautiful. I couldn't wait to set a bench tablescape. Tea Time on a picnic bench. Oh my! I'm so blessed. The daffodils are so beautiful. I bought a bag of daffodils called "The Works" from White Flower Farm. (not a sponsored post) They are truly amazing and I have "The Works" to show for it. Check it out HERE. I planted the yellow pansies last month and the plants are filling out nicely. I found the darling vase for the pansies at Michaels on clearance. St. Francis is watching over the garden. My little lamb is smelling one of my daffodils. I love having a cup of tea under my Flowering Plum tree. The little red flowers are falling from the tree as I take these photos. The Denim quilt was a gift to me from my son about 30 years ago. This is the best quilt to take anywhere. It is priceless at the sandy beach. The sand just shakes right off. The little pocket is to hold things and I thought a vintage hankie would be just perfect for today. My mother's hiking boots. I have fond memories of my mom wearing these boots when I was young. Check out my February Journal HERE. What a difference a few weeks of warm weather does for a growing garden. What a wonderful sunny afternoon. Anyone ready for a Garden Tour? I've put a new flower on my hat. Oh my word, this is such a beautiful setting. I love everything. Gorgeous. Your 4 hours a day are definitely paying off. The garden looks gorgeous. What a lovely setting for your tea time.. The daffodils are pretty and I love the cute blue/white pitcher..Lovely images, thanks for sharing. Enjoy your week ahead! How incredible! The perfect mix for Spring! Wish I was there for tea! Enjoy your week and Happy Monday! Great mosaic, so sunny and bright! Betty, How lovely! Looks like you are all ready for the garden tour. I love yellow and blue together. Your china is lovely and I bet having tea in the garden is a real treat. Happy Spring! Happy Tea Day! 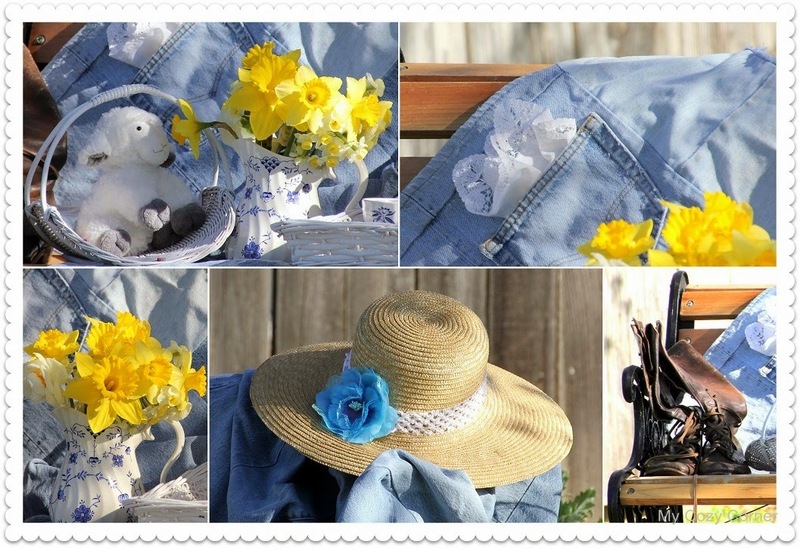 How lovely your blue and white looks with the pop of yellow daffodils, Betty! I LOVE daffodils and they were my fav flower when I was a little girl. They look so happy! Love the denim quilt. My DIL made one for their bed when she married my son. It was all patchwork squares of different coloured denim. Of course, I love your pretty teapot! Thank you for sharing and joining me for Tea Time. Have a beautiful day. How I would love to stroll around your garden and then sit and have tea with you. The denim quilt is fun and tucking in a frilly hanky makes it girly for us. I like the new blue flower on your hat! Happy Spring! You have had a lovely welcome with your mix of daffodils. They looks so gorgeous in your blue and white jug! What a wonderful find at the thrift shop! The jean blanket sounds like a trouper. Great to have at the beach! Your back garden looks so peaceful. It is a beautiful spot for spring tea, thank you for sharing! Ooooooo so wish spring would get to my part of the country! I just adore your tea set and daffodils and of course your setting! What a beautiful day you had! Thank you so much for sharing! What a lovely setting. Hope my part of the country gets real spring soon. My daffodils are coming up, slowly, but they are coming! I am in love with the pitcher filled with daffodils. I'm SO jealous of your warm weather and gorgeous flowers!! We had a dusting of snow again today and temperatures still in the 30's. Thanks for posting this beautiful setting! It's just what I needed today! HUGS! What a wonderful garden tea vignette! Isn't the combo of blue, white and yellow heavenly? Such cheerful crispness..and bliss! Love you denim and the lamb is adorable! Our Daffs are just coming into flower. Can't wait! Thanks so much for linking to Tuesday Cuppa Tea! What a beautiful picture (and day!). I am so jealous of your daffodils and bright sunshine...it's snowing where I live, again. Those pieces were a terrific thrift store find. Love the blues and yellow daffodils! love the styling of this post, relax yet elegance. love it. I remember when you started this garden and the pergola - it is looking lovely! Beautiful springtime is definitely arrived where you live! Beautiful...can't wait to see the colors of Spring again...still having snow here in Maine. Gorgeous! Isn't it wonderful to be outside with sunshine and yellow daffodils...lovely! Wow, that Johnson Brothers set was a great find! I love them. They pair perfectly with the daffodils, one of my favorite flowers! Such a pretty sight. And, there is so much sunshine in this post you can almost feel the warmth from here! Beautiful! Oh your daffodils are up...so jealous! Love your sitting area...do welcoming and screaming SPRING! Your pitcher and creamer are just lovely too. I have the matching dinnerware, its about 30 years old now but I still love the pattern. Congrats on your feature over at Kim's WOW party. Wishing you a wonderful day!